AFL has biggest fan base. 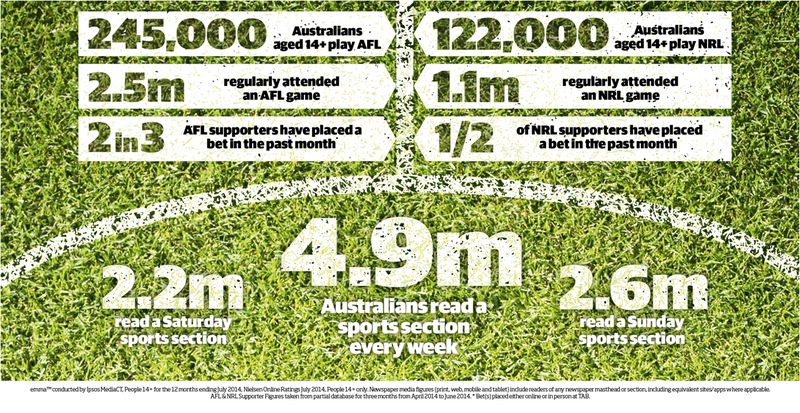 Some 6.3 million Australians aged 14+ support an AFL club, or 35 percent of the population. Women make up 41 percent of these supporters. The Sydney Swans – still South Melbourne for Victorian diehards with long memories – has the biggest fan base with 1.1m supporters, of whom a third live outside NSW. Hawthorn has a greater percentage of out-of-state fans, its 48 percent figure boosted by marketing activities in Tasmania. The highest percentage of out-of-state fans (48%) belongs to silvertails, Carlton. 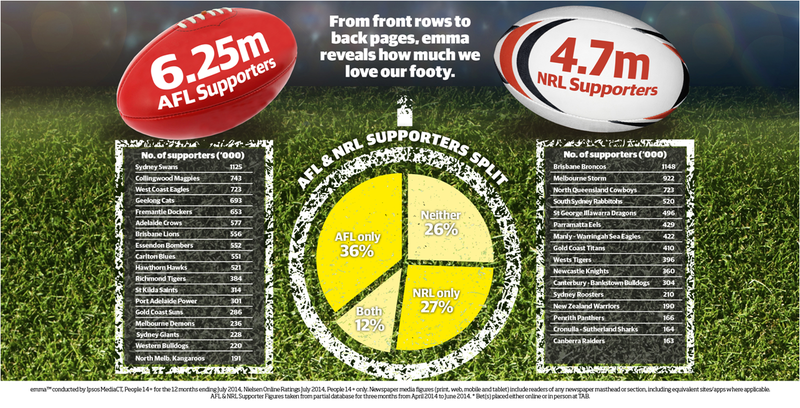 Victoria, the home of AFL, is the epicentre of the sport with 2.5m (37%) followers. Working-class Collingwood – the mighty Magpies – has the most supporters (740,000) of all Victoria-based clubs, followed by Geelong (693,000). The average supporter base is 420,000 fans. According to emma, Rugby League has 4.7m followers and boasts the best supported club in the country – the Brisbane Broncos (1.2m fans). One in three are female, the same ratio as NRL fans overall (37%). The Grand Final this year pitches the two of the most passionately supported teams against each other – the South Sydney Rabbitohs (520,000 fans) and the Dogs of Canterbury-Bankstown (305,000 fans). Some 2.5 million Australians aged 14+ attended an AFL game this season, making it the highest attended code. NRL is third on the list with 1.1m fans attending a game, slightly lagging the 1.4m who went to the cricket.